Addison-Wesley. Paperback. GOOD. Spine creases, wear to binding and pages from reading. May contain limited notes, underlining or highlighting that does affect the text. Possible ex library copy, thatâll have the markings and stickers associated from the library. Accessories such as CD, codes, toys, may not be included. Addison-Wesley Longman, Incorporated, 1987. Paperback. Good. Disclaimer:A copy that has been read, but remains in clean condition. All pages are intact, and the cover is intact. The spine may show signs of wear. Pages can include limited notes and highlighting, and the copy can include previous owner inscriptions. At ThriftBooks, our motto is: Read More, Spend Less.Dust jacket quality is not guaranteed. Reading, MA, U.S.A.: Addison-Wesley, 1987 Light cover and spine creases.. Trade Paperback. Good. 8vo - over 7¾" - 9¾" Tall. Addison-Wesley. Used - Good. Good condition. Owner's name on endpage. Writing inside. Addison-Wesley, June 1987. Paper Back. Acceptable. Addison-Wesley. PAPERBACK. 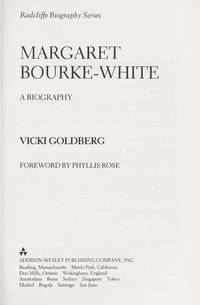 0201098199 Goldberg, Vicki. Margaret Bourke-White. Rose, Phyllis. Reading, MA: Addison Wesley, 1987. 426pp. Indexed. Illustrated. Bibliography. 8vo. Paperback. Book condition: Very good with lightly rubbed edges and light creasing to spine. . Very Good. 1987. Addison-Wesley, June 1987. Paper Back Paper Back. Good. Good Softcover. Light soiling and scuffing to covers. Sticker residue on front cover. Spine has creases. Pages clean and tight in binding. Pictures Available Upon Request. Reading, Massachusetts: Addison-Wesley Publishing Co, 1987. Softcover. VG- (Ex-lib., sticker at bottom of spine; Light crease at spine). Off-white wraps with bw photo; 426 pp. ; 54 bw photos. Foreword by Phyllis Rose; Part of the Radcliffe Biography Series. Addison-Wesley. New with no dust jacket. 1987. Paperback. 0201098199 . Addison-Wesley. PAPERBACK. 0201098199 Like New Condition. . Fine. 1987-05-01. Good. Ships with Tracking Number! INTERNATIONAL WORLDWIDE Shipping available. May not contain Access Codes or Supplements. May be ex-library. Shipping & Handling by region. Buy with confidence, excellent customer service!